How can I limit my post-build events to running only for one type of build? 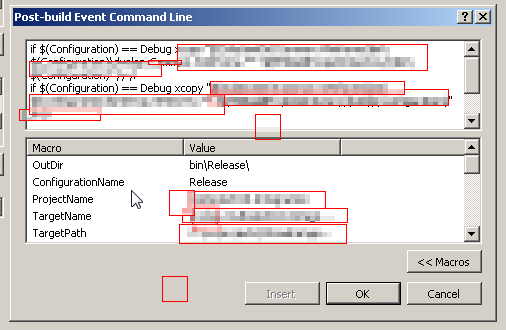 I'm using the events to copy DLLs to a local IIS virtual directory but I don't want this happening on the build server in release mode. Pre- and Post-Build Events run as a batch script. You can do a conditional statement on $(ConfigurationName). You can pass the configuration name to the post-build script and check it in there to see if it should run. This works for me in Visual Studio 2015. I copy all dll-files from a folder located in a lib folder on the same level as my solution folder into the targetdirectory of the project being built. $(ConfigurationName) was listed as a macro, but wasn't assigned. Is it possible to use conditional compilation symbols in VS build events? How to get Visual Studio 'Publish' functionality to include files from post build event?